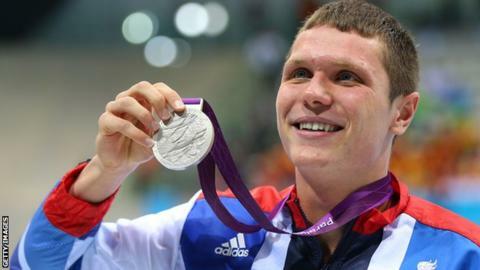 Swansea-based swimmer Aaron Moores was among nine Paralaympics GB gold-medallists on day seven of the Rio games. The 22-year-old just beat team-mate Scott Quinn in a finger-tip finish as Great Britain claimed a one-two in the SB14 100 metres breaststroke. Moores, from Trowbridge in Wiltshire, trains in Swansea and is funded by Disability Sport Wales. "I can't believe it, I'm so glad about moving to Swansea," he said. "The whole team down there have just picked me up and moved me forward." His gold came on a day when Paralympics GB overtook their medal haul from London 2012 - making Rio their most successful games. Great Britain's tally includes golds for Welsh athletes Aled Sion Davies,Rob Davies,Hollie Arnold and Rachel Morris. Wheelchair basketball player Phil Pratt, of Cardiff, helped GB to a 22-6 win over Australia in the quarter-finals. GB face Spain in the semi-finals on Thursday, 15 June with Turkey and United States contesting the other game. GB Paralympic team for Rio - who's in?